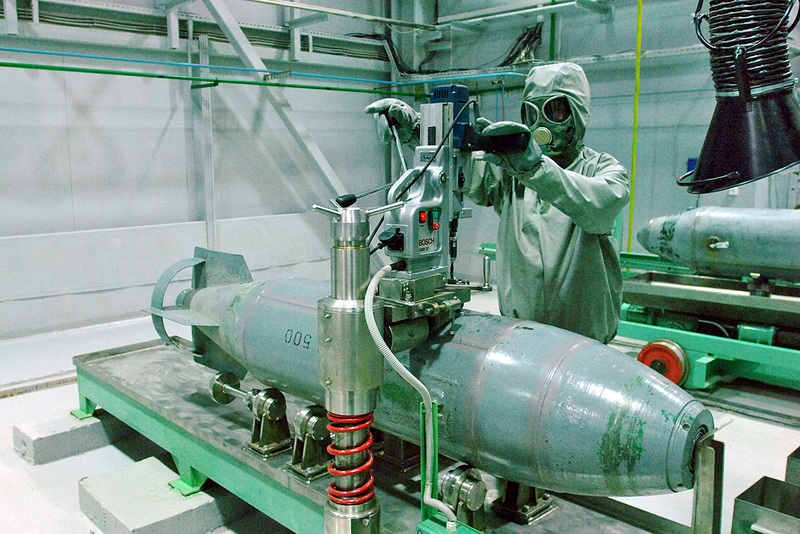 An employee wears a gas mask and suit as he works at the chemical air weapons destruction facility at the Settlement of Maradykovo, Kirov Region. On the night of June 12, the Russian military destroyed the last warheads containing sarin, mustard, and soman gas. Experts say that only one percent of the stockpiles of chemical weapons inherited from Soviet times remains to be dealt with. At the start of the week Moscow destroyed its last stockpiles of sarin gas in accordance with the 1991 Nunn-Lugar program, that provided financial assistance to the countries of the former USSR to dispose of decommissioned nuclear and chemical weapons - and also the means of their delivery. Part of the program was a convention on the disposal of chemical weapons, Russian stockpiles of which - towards the end of the last century - amounted to around 40,000 tons of chemical warfare agents. They were kept in remote locations, far from prying eyes and out of the way of anyone with hostile intent: In the settlement of Gorny in the Saratov Region, the town of Kambarka (Udmurtia), the settlement of Kizner (also Udmurtia), the town of Shchuchye in the Kurgan Region, the settlement of Maradykovo in the Kirov Region, the village of Leonidovka in the Penza Region, and the town of Pochep in the Bryansk Region. "They were organophosphorus agents and nerve and blister agents - mustard agent; lewisite; compounds of lewisite and mustard agent; sarin; soman and VX gas - all packed into artillery shells, mortar shells, multiple-launch rocket systems, aviation bombs, tactical and short-range missile warheads, railroad tank cars, and other containers," RBTH was told by TASS military analyst Viktor Litovkin. He said they were stored fairly securely in wooden hangars in which artillery shells lay on shelves, all in a row, like books in a library. They did have their fuses removed, however. "All the storage depots were fitted with lightning conductors and banked up with mounds of earth. Each building had sets of fire extinguishing equipment and several fire extinguishers. It’s hard to imagine that anyone could have done anything with this equipment if, for instance, shells with VX had caught fire. But thank goodness nothing of the kind happened or at least we simply never got to know," he noted. Each storage and warhead disposal place was in a remote location far from towns and population centers. "I remember Kambarka, for instance, where there were reserves of mustard agent and lewisite stored in enormous railroad tank cars. In the early 1990s the little town, located near the River Kama, had neither mains water supply, nor drainage, nor gas nor telephones in people's houses," the expert recalls. And the only factory in the town was a little engineering works founded in the time of Peter the Great (early 18th century) which made electric shunting locomotives. According to the analyst, the program for the elimination of chemical weapons was also geared to improving people's everyday lives - by building factories, roads, and other essential infrastructure. According to today's exchange rate, it cost more than 300 billion rubles ($5.3 billion), 10 percent of which was spent on these construction projects. "We should not try to hide the fact that Western countries gave us tangible assistance in destroying our chemical warfare agents. First and foremost it was the European Union, Canada, and the U.S. Hundreds of millions of dollars and euros were involved. According to different figures, it was between two and five percent of Russian costs," RBTH was told by Viktor Murakhovsky, editor-in-chief of the magazine Arsenal Otechestva. The assistance included deliveries of essential environmental monitoring equipment and instruments. One of the key arguments in U.S. Congress was the one put forward by Democratic Senator for the State of Georgia Sam Nunn: That if the Russians destroyed their mass casualty weapons then these weapons could never threaten America. The argument proved to be a highly forceful one. In all the centers of population where chemical weapons are being destroyed, modern residential settlements with all necessary infrastructure have been established - there are shops, outpatient centers, hospitals, schools, recreation centers, and even sports complexes. Drainage, water, and gas pipes have been laid everywhere and modern means of communication provided. In other words, according to analysts, the program for the disposal of chemical weapons has worked to Russia's benefit. A new problem arises today, however - it is connected with the recycling of the waste produced in the process of deoxidizing chemical warfare agents. "The chemical agents in the shells, rockets, aviation bombs, and other containers are destroyed by making an opening in the casing and introducing substances that convert the chemical agents into a non-toxic mass that can then be processed," Litovkin noted. A certain proportion of this waste can be termed “useful”: From some of it arsenic can be extracted, which can in turn be used in the manufacture of components for the electronics industry, while other substances can go towards the production of polymers and pesticides. Russia has more than 140,000 tons of such waste, experts estimate. Another 100,000 tons of waste remains that cannot be processed and can only be buried at special sites. This is something that will require additional funds and it is not clear at the moment where they will come from.